Dream Homes, Z&Z Excavation and Gray Paws representatives met this morning on the property to begin the work!! Stay tuned for more information as the dream becomes a reality for the old dogs! In its fourth year, “Larry’s Heroes” honors five ordinary individuals in the community who have done extraordinary things. Darla Poole Brescia, co-founder of Gray Paws, a sanctuary for abandoned Senior Dogs has been chosen as one of this year’s five “Larry’s Heroes” and was interviewed on “KDKA Morning News” to talk about the Gray Paws Sanctuary. Hear the interview here. This is an extremely emotional announcement as the vision of Gray Paws Sanctuary is becoming a reality! We are so overwhelmed with the love these old dogs give us every day. We wake every morning to smiling faces and happy tails. We end each day with fur babies all around us – usually snoring! Even when the time comes to say goodbye to one of our babies – which we know is inevitable, but still never easy – we know that we have done our best to give them quality of life until their last breath. We are so fortunate to be able to do this work. We have our health, a strong network of support and a passion to help these lovable creatures! The major obstacle we are tackling is the physical structure of the home we live in now – and funding to make a new sanctuary. There are steps everywhere in our home now that just aren’t safe for senior dogs. Our recent land purchase and the new one level home are very costly – but we are going to do this!! We are taken aback by the generosity of people on a daily basis. Donations come from those that can only afford $10 and some much more. Every dollar counts – and we are sking for your support! Now the even harder work begins as we move forward with the site readiness and sanctuary home installation! Won’t you be a part of our success? Super Duper Flea Market for the Old Dogs wins my vote for the most unusually named fundraiser, and it benefits a unique cause. The event is 8 a.m. to 2 p.m. next Saturday at 2828 Broadway Blvd., Monroeville (15146). Proceeds benefit “abandoned senior dogs” who live in the Gray Paws Sanctuary. You can come to shop or come to sell. Suggested donation is $20 to set up a table, and you can keep your profits or donate your items to Gray Paws and they’ll sell it. (No furniture, please). Gray Paws Sanctuary is actually the North Versailles home of Darla Poole Brescia and her husband, Joe. They currently share it with eight old dogs. The oldest is Brandy, 16, a white husky/chow mix. She’s been with them since November 2013 when her owner took her to an Ohio shelter to be euthanized rather than have her treated for arthritis and a skin condition. The Brescias got her the needed veterinary care, and Brandy is happy and doing just fine. “This is a sanctuary. They will all stay here until they die,” Mrs. Brescia said. Paying for their care “is entirely dependent on donations and what Joe and I pay out of pocket.” Veterinary bills last year were $5,000. Why do they do this? The couple just have a soft spot for sweet old dogs, and their mission is to give them love and a safe haven for the last months — or years — of their lives.They get the old dogs from shelters and rescue groups. They’re looking for property to create a “real” sanctuary where they could help more old dogs. 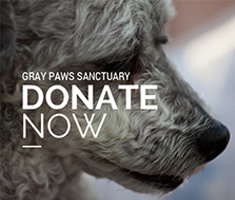 Donations can be mailed to Gray Paws Sanctuary, 211 Arlington Ave., North Versailles, PA 15137. This is a 501(c)(3) nonprofit. The next fundraiser is a June 6 golf outing at Rolling Fields in Murrysville. Go to www.facebook.com/GrayPawsSanctuary or graypaws.org for information. Pet Tales appears weekly in the Saturday Magazine section. Contact Linda Wilson on her Facebook page, lfuoco@post-gazette.com or 412-263-3064.